On Saturday, the Janata Dal United president gave it back to them, and hard. Mr Kumar dared Sharad Yadav and his motley group of loyalists - who claim they are the "real" JD (U) - to go ahead and "break" the party. 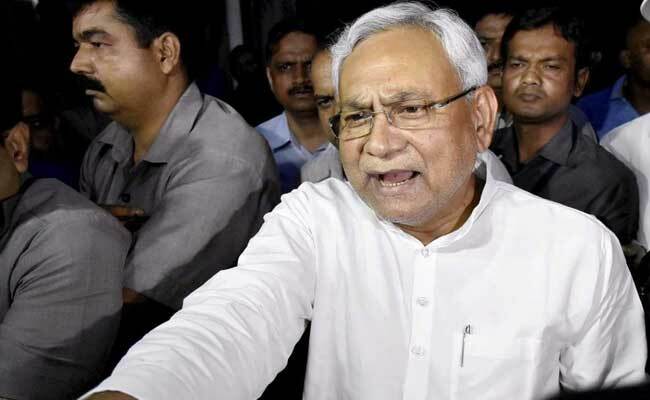 For days, Bihar Chief Minister Nitish Kumar has responded to non-stop jibes from his former ally Lalu Yadav and his sulking partner Sharad Yadav with a studied silence. "Break the JD (U) legislative party if you have the might... Prove a two-thirds majority within the party for breaking it," a combative Chief Minister declared, shortly after the party's top decision-making body decided to join the BJP national coalition. If they could not, Mr Kumar said, they would be booted out. The party has already suspended Rajya Sabha member Ali Anwar Ansari and 21 other Bihar leaders. Sharad Yadav who co-founded the party hasn't been suspended so far but has lost his post of the party's leader in the Rajya Sabha. Mr Kumar had tasked his general secretary KC Tyagi to draw the red lines for Sharad Yadav earlier in the day, telling him that the party would shut the doors on him if he participates in Lalu Yadav's rally on August 27. Spelling out his numbers, Mr Kumar said 71 members of the assembly, 30 members of the legislative council, two Lok Sabha members and seven of the nine Rajya Sabha from Bihar were united. The other two Rajya Sabha members are Sharad Yadav and Ali Anwar Ansari. "One of them is so great that he reached where he is (Rajya Sabha) on the strength of the BJP support (in 2012) but look what he is saying today," he said, an oblique reference to Ali Anwar Ansari. "My colleagues say... and sometimes I also feel I am stupid," the Chief Minister said, pointing that he had got Mr Ansari elected to the Rajya Sabha, not once but twice. "And now, he is preaching to me" he added. Mr Kumar also sought to punch holes in the narrative being built by Team Sharad Yadav that the mandate in the 2015 elections was for the secularism, or the grand alliance that voted him to power in partnership with Lalu Yadav's Rashtriya Janata Dal and the Congress. Mr Kumar retorted that secularism did not mean one family enriching itself. "The mandate was for serving the people of Bihar and not for enriching one family," he said, a clear reference to Lalu Yadav family. Mr Kumar had pulled down the alliance over allegations of corruption against Lalu Yadav's son and his deputy Tejashwi Yadav. "The mandate was to work for the people of Bihar and not to carry the load of sins of such people," he added.